Guess what friends. I have started a new project. (I have really bad ADD when it comes to projects around the house. I will start something and then it takes months to finish. Partly because I am blessed with a busy work schedule, but I do think ADD has something to do with it). However, last week I did start this project and I'm so excited!! 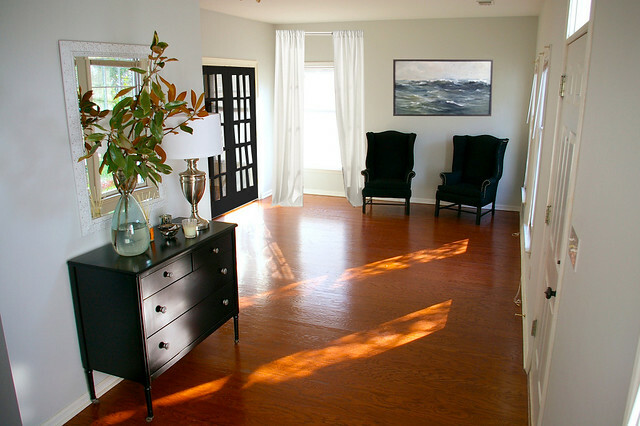 I'm in the process of painting the french doors in our living room black. If you remember I was going to paint the back of the front door black, but I felt if I did the french doors it would give more balance in the room and be more interesting (with the panes). JUST KIDDING! This is the mock up I did in Photoshop. But hopefully it will look similar (better). The painting I added to the mock up is very special and requires it's own post. I don't have it yet... but stay tuned. I will tell you about it! How fun! I want to do this one day as well. Not sure the husband will be convinced. Maybe over time since we've only been here a few months. Cannot wait to see the real after! I just love your blog! It's going to be fabulous and I can hardly wait. I think it will look fabulous. I am obsessed with black doors, I have a whole pinterest board dedicated to them. I love the mock-up! Painting French doors in our home is on my to-do as well, it's nice to have more of a visual now of how it will look. I look forward to seeing them when you're done! Oh I love it! I have a set of french doors maybe I could do something???? Love this idea! Can't wait to see the real thing! I have project ADD too!!!! There are so many projects to work on in a house and I'm constantly seeing so many beautiful ideas. I always end up working on too many things at once with chaos in the rest of the house. My goal for the new house is to work on the spaces slowly and let things evolve, instead of being in such a rush to get to the finish line. It's the journey that makes the space unique, right? I love a black door! I painted our front door black the moment we moved into our home several years ago...and just painted our pantry door black, without telling my husband. He loves it...and so does everyone else who walks into our kitchen! I just redesigned a kitchen and suggested they paint their french door black. The owners were resistant at first, but absolutely LOVE it now. Can't wait to see your black doors finished! We are renovating a lake house and the plan is to paint all of the interior doors black but, I have been debating if we will paint the sets of french doors black along the back of the back house too. I can't wait to see how yours turn out. I bet they will look great! Bryn! Painting my doors is the next project on my list and I've just been trying to do some research about what paint is best and the best techniques... do you mind sharing any tips and what type of paint you used/color? Would love your input!! Bryn, your mock-up looks amazing, so I know the doors will be just the right addition to your pretty room. I like the black! Glad you decided to go for it. I currently have two side tables awaiting paint sitting in my living room, so I know the feeling of project overload and moving from one to the next! My mom has really tall doors in her house and she had them all painted a deep brown. I wasn't sure about it at first but now, they look fabulous. I totally thought that was the finished product! I'm loving black doors lately. I'm considering doing the same to the inside of my front door, but black scares me, so I'm going to have to think on it for a while! Love the black doors! I think I have your same ADD problem when it comes to fixing up things around the house, lol. I start stuff, but it takes me forever to finish. 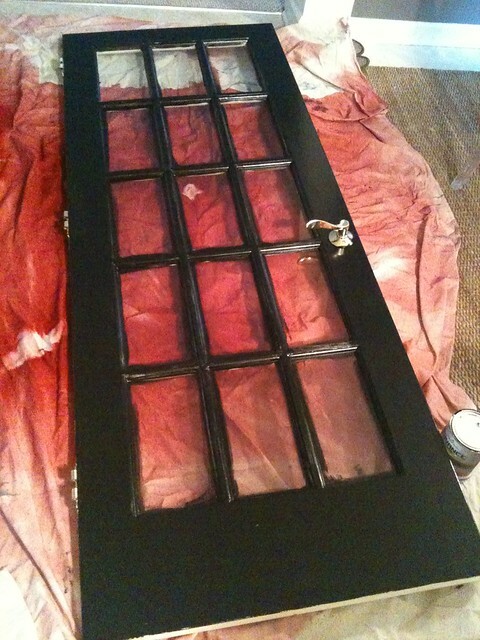 Love black doors....this is such a cool project..but it looks alot harder than doing it on a plain solid door. I have been thinking of doing that exact thing. It's quite a look I think. I painted all my doors leading outside black!! Love it! Painting doors are the easiest way to add a pop! Painted my kitchen door a beautiful orange and LOVE it!!! Huge fan of the painted black doors.